You can publish a schedule with some or all of your shifts open (unassigned) and have the employees sign into their account and choose shifts off the Tradeboard. This method is used by many volunteer organizations. “Never” – Employees cannot see or pick up Unassigned shifts. 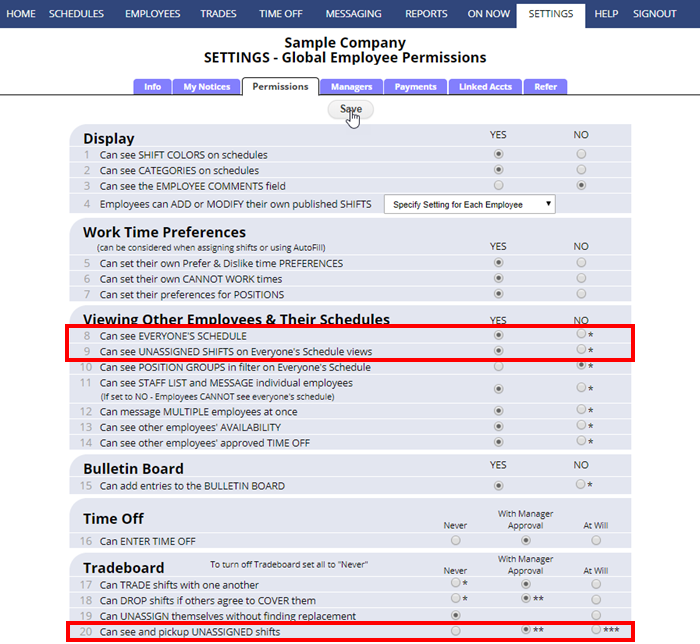 “With Manager Approval” – Employees can see Unassigned shifts on the Tradeboard and can submit a request to pick them up. When they click to request to pick up a shift, the request is sent to the manager for approval. (More than one employee can request to pick up the same Unassigned shift and they will see the number of other requests that have already been submitted for that shift). The manager views the requests, listed in the order they were recieved, and selects one to approve. Upon approval by the manager, that employee is notified and scheduled to work the shift and it is then removed from the Tradeboard. Employees can cancel their own shift pick up request at any time before manager has denied or approved it, using the “Cancel This Request” link on their TRADES page. “At Will” – Employees can see Unassigned shifts on the Tradeboard and immediately pick them up if they are under the maximum hours per week that you have set for them. Note: If picking up an unassigned shift would put the employee over their maximum hours per week, it is sent to the manager for approval. In this case, the shift remains on the Tradeboard (showing that there is a request) and another employee (not over their maximum hours per week) can take the shift and it is immediately assigned to them and removed from the Tradeboard.